A delightful cast of characters take up residence in this fabulously funny read perfect for fans of The Best Exotic Marigold Hotel. Jo Docherty and Hattie Contaldo have a vision: a holiday retreat in the heart of England’s Lake District exclusively for guests of a “certain age” wishing to stimulate both mind and body with new creative experiences. 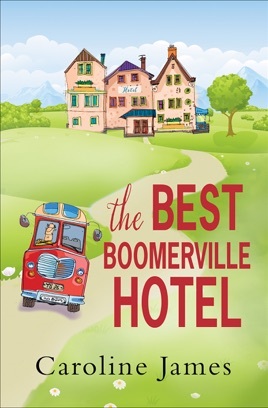 With a pitch like that, the newly renovated Best Boomerville Hotel attracts plenty of eccentric clientele. There’s fun-loving Sir Henry Mulberry and his brother Hugo; Lucinda Brown, an impoverished artist with more ego than talent; Andy Mack, a charming Porsche-driving James Bond lookalike, and Kate Simmons, a woman who made her fortune from an internet dating agency but still hasn’t found “the One” herself. With such an array of colorful individuals there’s bound to be laughs aplenty. But there’ll be plenty of fireworks too, as the residents of Boomerville learn that friendships and romance can tumble out of control when you’re this far over the hill.